Did Prince William Have a Boy or a Girl? The world watched and waited, and Kate spent about ten and a half hours in labor. At 4:24 pm London time, the Duchess of Cambridge became a mommy! 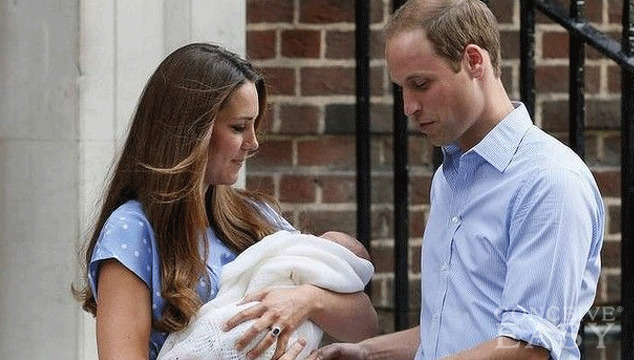 A little over 24 hours later, paparazzi spotted the royal hairdresser arriving at the hospital with a trunk of supplies, a garment bag and a baby seat, and we all knew that it wouldn’t be much longer until we got to see a glimpse of the new little prince! It was 7:14 pm on Tuesday night when the little prince made his debut with his brand new mommy and daddy,and he certainly was a cutie pie! After we got a glimpse of the little royal cutie, we all still had to wait for Will and Kate to announce his name! They picked a very traditional name, calling their new little guy George Alexander Louis. His “royal” name will be His Royal Highness Prince George of Cambridge. Six previous British kings have been named George, so it is a very common name for British Royalty. We are all still anxiously awaiting Prince George’s first official royal portrait, he sure looks to be a cutie! After getting pregnant just 9 short months ago, the world has been waited with bated breath for this day to come. And now it’s here!